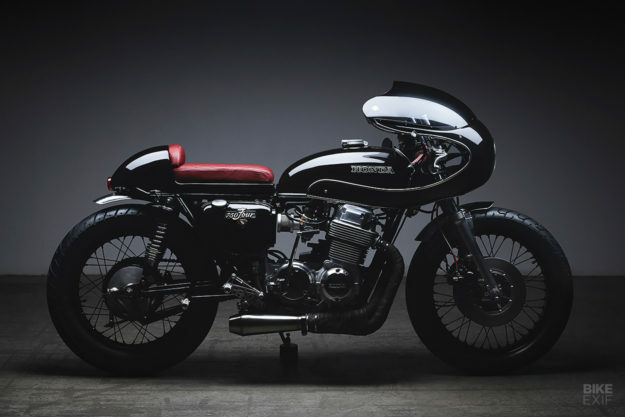 When a dog ran out in front of Nick Acosta’s 1974 CB750K it changed his world. He had just done a little brake work and was taking his bike for a spin when a canine torpedo shot out to attack his wheel. Nick tried evasive maneuvers, only to end up totaling the bike and severing his calf muscle. Clip-ons, Motogadget bar-end indicators, forks, a wheel…everything was done for, except Nick’s love for building and riding. With a fire to create something special from the wreckage, Nick began doing all the things he was “eventually going to do with the bike”. But now he had time and a stronger motivation. Nick had never tackled a full build, but learning something new wasn’t strange to him. “My dad is a carpenter and my mom is a chocolatier. I grew up in a very ‘hands on’ kind of environment”. 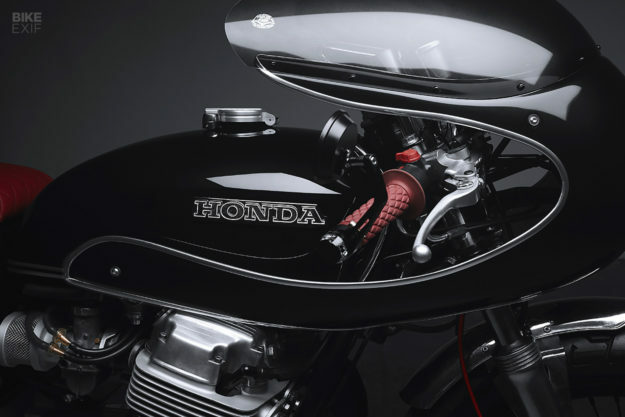 With a cafe racer project in mind and months of therapy ahead, Nick started watching videos and reading about rebuilding Honda’s iconic inline 4. The CB750 got a complete teardown. Inspection, cleaning, honing and rebuilding kept Nick busy for a short time. He installed a new Dynatek ignition system and bolted on a Cyclexchange 4-into-1 exhaust system before moving on to more aesthetic work. 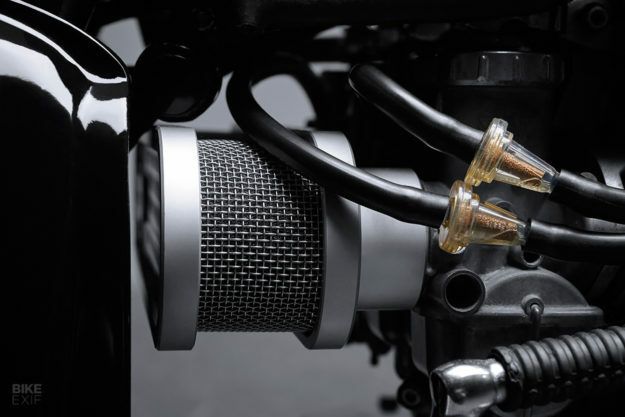 The air intake box is from Cognito Moto, also made from billet aluminum, giving the bike a unique look compared to the usual pod option. “I was faced with a style dilemma”, Nick says of the next step. 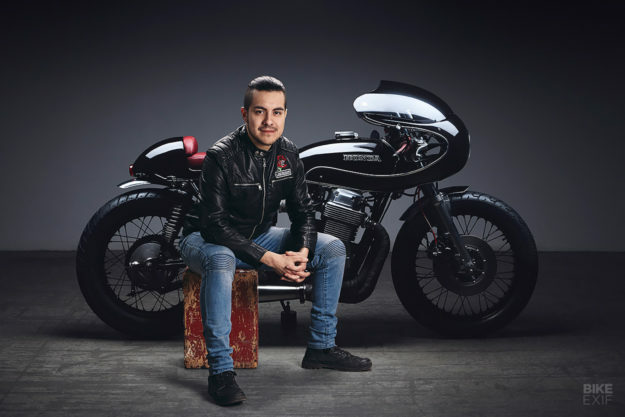 Settling on a period-appropriate cafe style with modern upgrades where possible, Nick began a process that ultimately aggregated the talents, efforts, and care of a large number of craftspeople in the Toronto moto scene. “I couldn’t have done this without them”. A love for industrial design and simplicity would normally have led to the immediate delete and relocation of the side covers and oil tank. 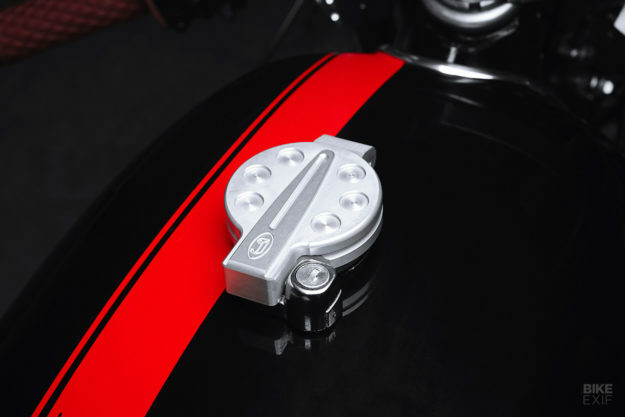 Nick says, “I just love the classic look of the oil tank and side covers that the bike originally had”—so they stayed. 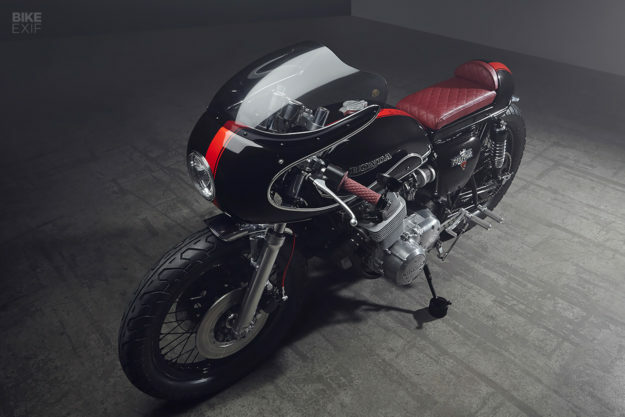 To keep things sleek, Nick ended up using a vintage fairing and seat from a local manufacturer who works with the Vintage Road Racing Association in Canada. A matching windscreen from Gustafsson Plastics completes the fairing. 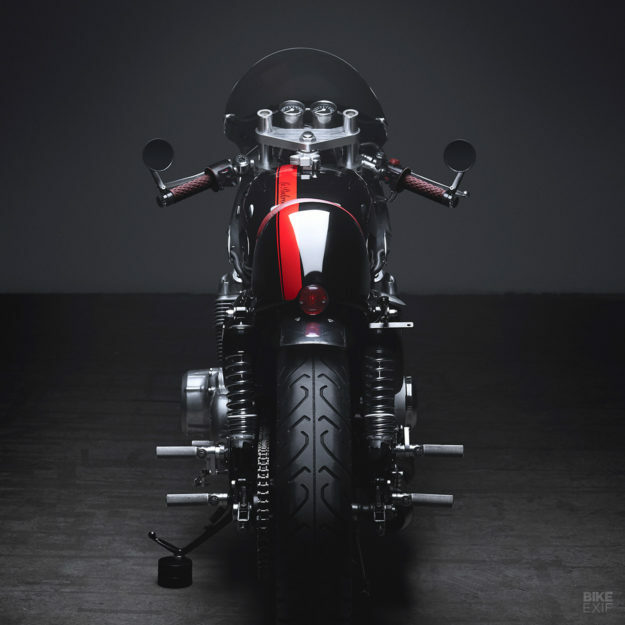 “I was lucky enough to meet and develop a great working relationship with Brian Kates of MotoBrix, a very talented metal worker in Toronto who also builds motorcycles. 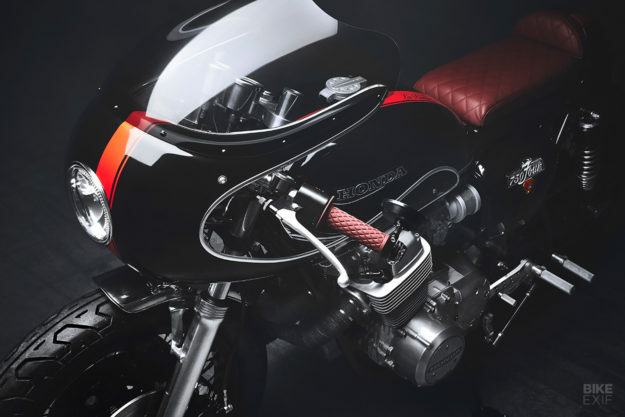 He made an ingenious system to easily mount the seat and fairing onto the motorcycle with minimal welding to the frame”. 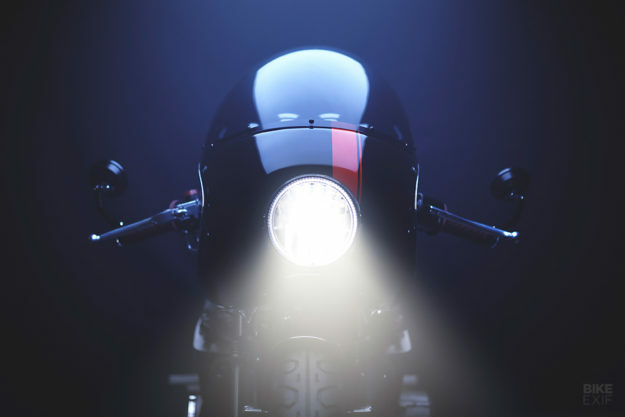 After the mounts were finalized, the seat and fairing were drilled and cut to fit the front and rear lighting, also making sure there was proper clearance for the clip-on handlebars. Swapping in forks from a 1975 GL1000 provided a slightly stiffer front end (and dual disk braking) without the need for gusseting the frame. Finishing up the front end, Nick rebuilt the wheel with new spokes, bearings, rebuilt calipers, forks, and added steel lines for a touch of class. To complete the cockpit Nick added Motogadget bar end indicators, new handlebar controls, a speedo and tach, LED Indicator lights, mirrors, and a clock to bring everything together. “I’m a bit of a nut for the clean industrial look of billet aluminum, and incorporated it into many parts of this build, from the gas cap, to the triple top, petcock bowl, clip on handlebars, gauge bracket, and rearsets and passenger pegs”, Nick says. 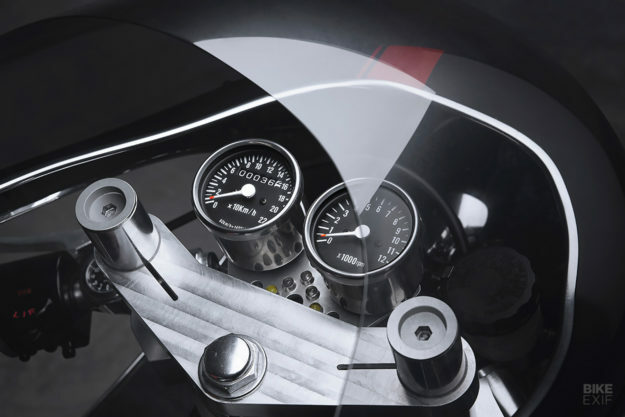 Then came the question of integrating the right-side rearset with the kickstart lever. “A lot of times you have to decide which you’re going to keep”. With a little engineering, Nick was able to keep both. Nick designed a flip-up system for the brake actuator, which gives the kickstart lever enough clearance to get the job done. “I’m in engineering, which is just figuring out ways to solve problems, really…”. Paint was expertly handled by the talented Amanda Brisibois of Toronto’s Black Widow Custom Paint. “She mixed a black cherry base with a micro red metallic, and on the stripe she mixed gold pearl with the red to give it a flip effect. 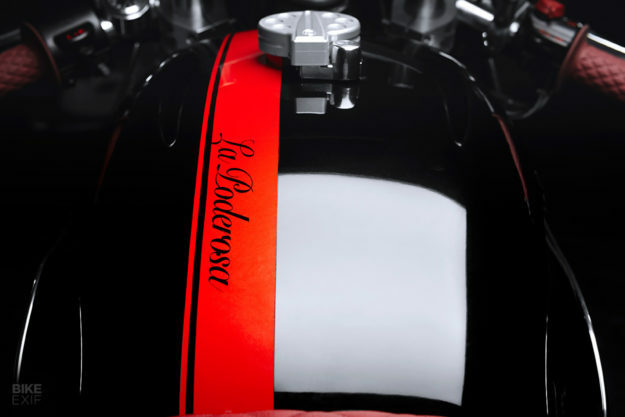 The motorcycle’s name, ‘La Poderosa’, is stenciled into the racing stripe as well”. 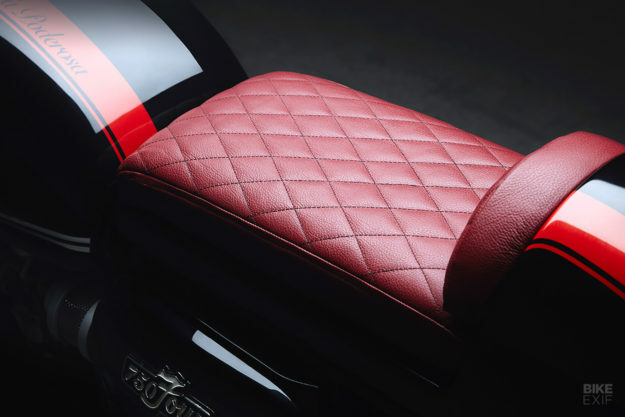 David Aversa of Raven6 Customs made a beautiful diamond quilted oxblood red leather seat, and a seat pan to fit the bubble seat. 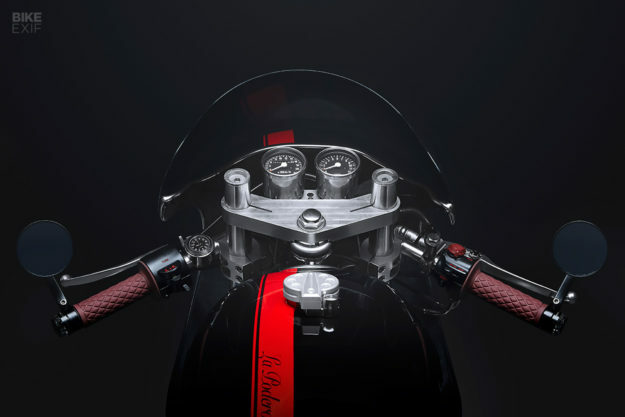 The seat is also interchangeable with a brat style seat of the same leather and design in case a passenger is ever on board. Nick says the name “La Poderosa” (meaning “The Mighty One” in Spanish) springs from the motorcycle that Ernesto ‘Che’ Guevara and Alberto Granado took on their life-changing trip across South America. Fitting, after what Nick and this bike have been through! After completing La Poderosa, Nick is hopelessly bitten by the bike building bug. 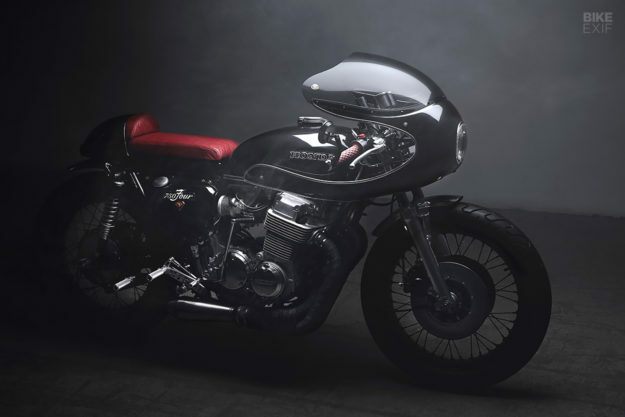 “I plan on doing many more custom motorcycles, as well as classic restorations, and pushing my boundaries with every build”, he says. From picking himself up from the pavement to this beautiful build, we find ourselves strangely agreeing with Che himself.